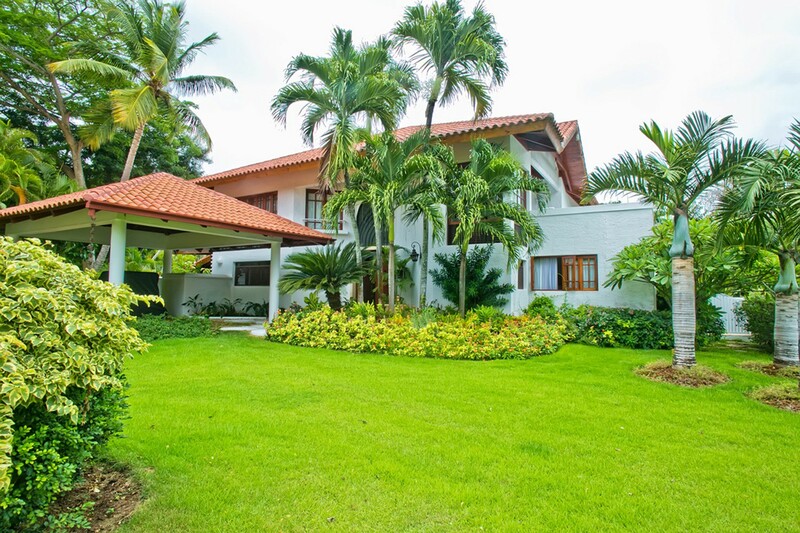 Villa Laguna Casa de Campo Dominican Republic. 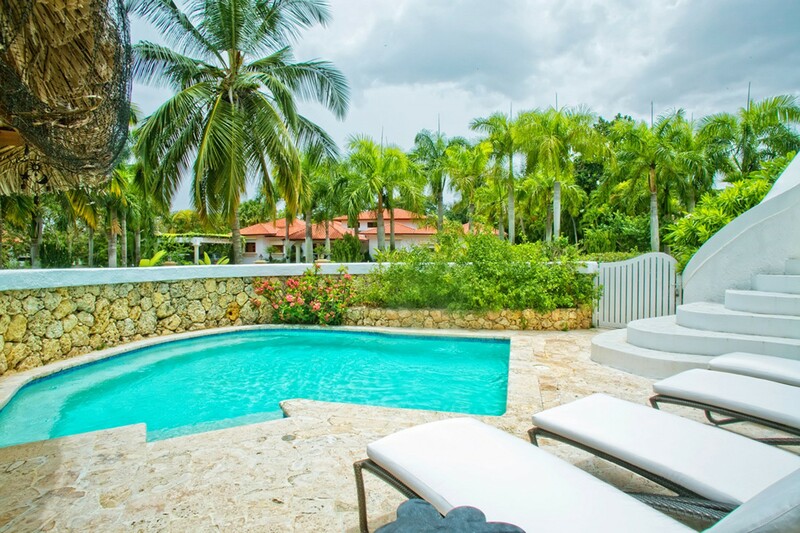 Just moments from the beachfront of Casa de Campo in the Dominican Republic, the utterly delightful Villa Laguna provides an ideal place for a family holiday or group getaway. 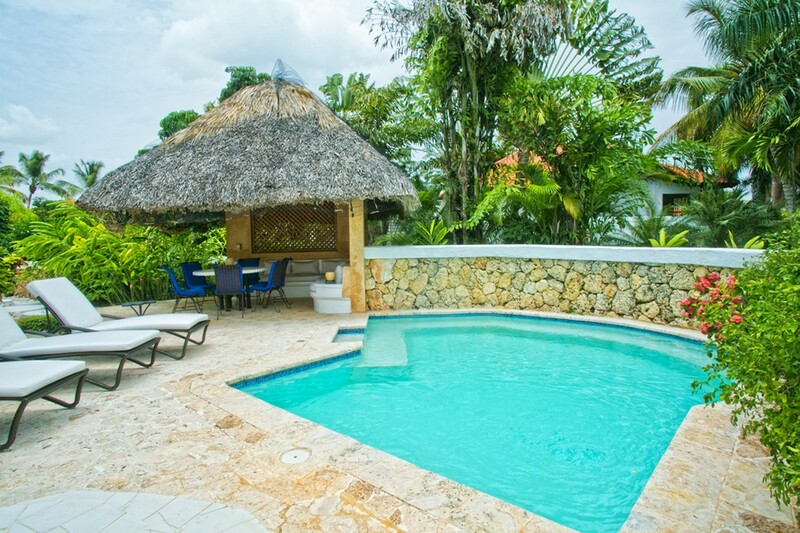 The two-story villa is framed by a lovely garden ideal for children's play times, but also offers a completely private pool area tucked beneath the shade of the many mature palms that sway gently overhead. 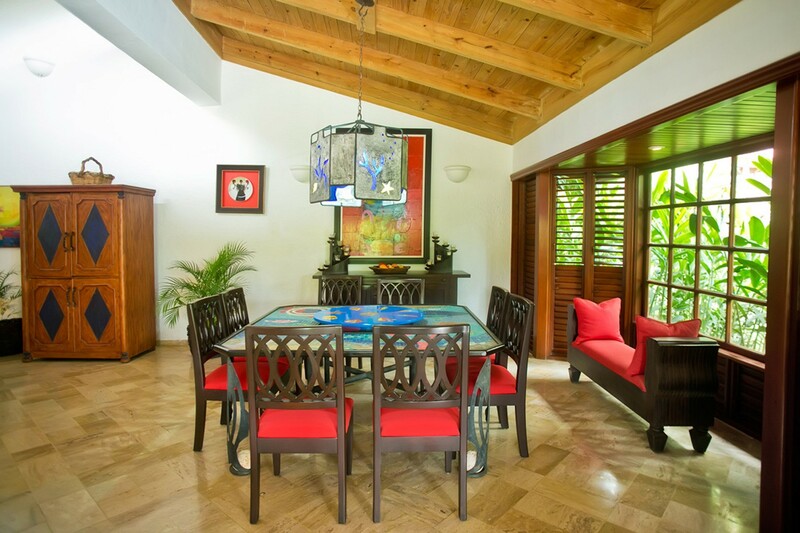 This villa is full of curving lines and appealing niches, especially in the lovely pool terrace area. A stacked stone privacy wall frames the delicate shape of the pool, and the smooth stone terrace creates the ideal spot for the sun deck that takes you indoors or to the charming grass-roofed gazebo ideal for al fresco dining as well as lounging on the oversized, banquette sofa. When you do head indoors, be prepared for the stunning style of the spacious interiors. 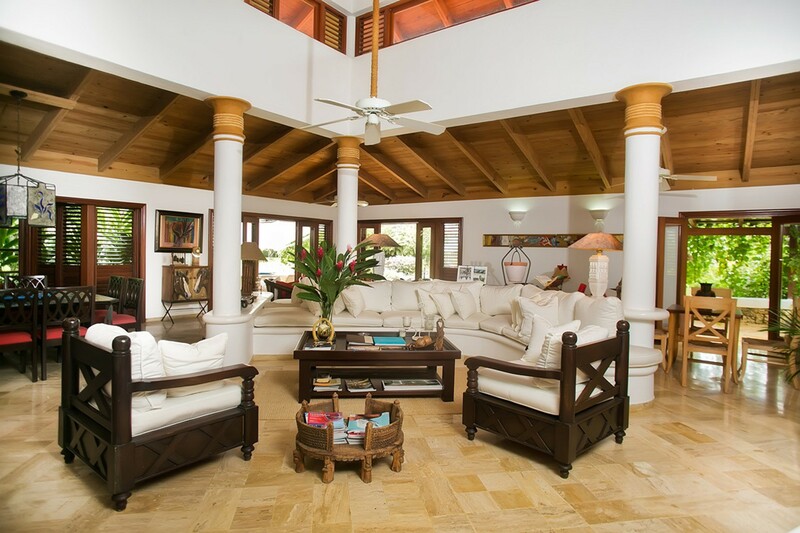 The great room features lofty ceilings and elegant columns that define the individual lounging and dining niches. Both casual living room areas as well as formal and casual dining spaces are found here, and feature remarkably colorful accents. The gourmet kitchen is also a pleasure, with views of the setting, and is a great spot for enjoying the daily breakfast service in your villa. You also enjoy the services of a concierge, butler and housekeeper in addition to having access to the resort's amenities. 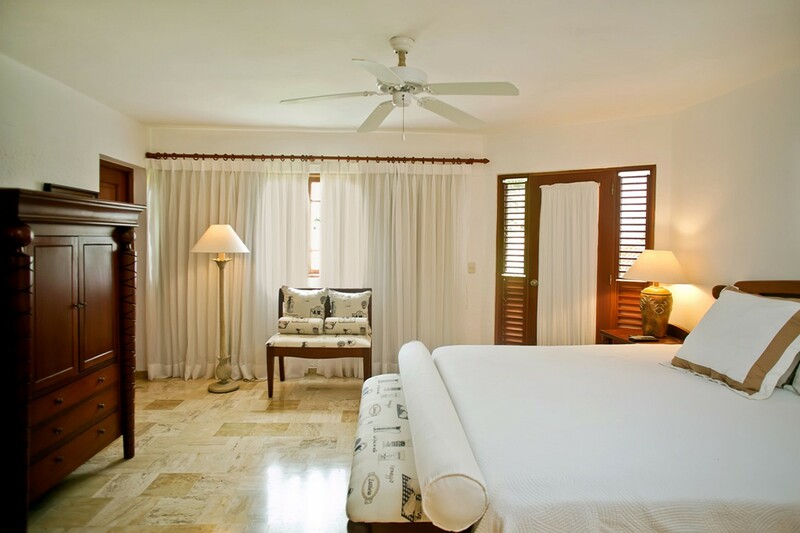 The four bedrooms include two king suites, one of them a master suite with private patio access and a large ensuite bath. 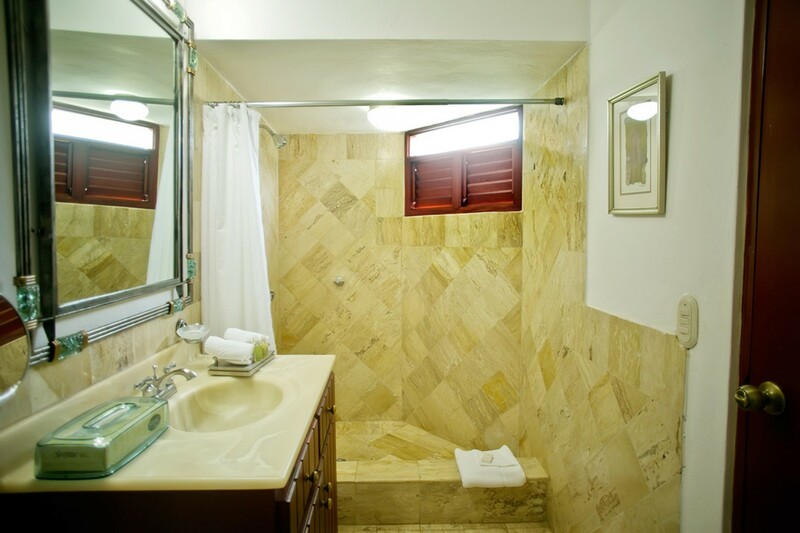 The other suites offer two double beds and ensuite baths. All have access to the garden. 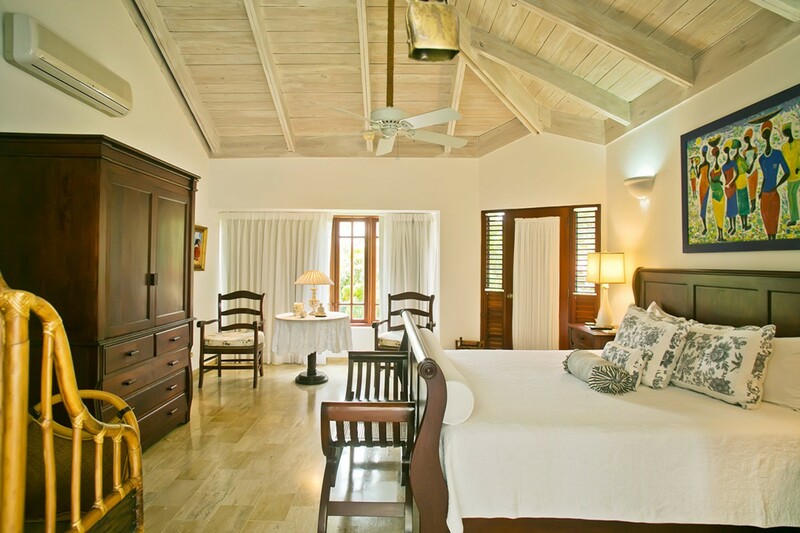 The Villa Laguna is a wonderful find for those seeking an unforgettable Caribbean holiday, and with the many amenities of the resort, it makes it a luxurious experience too. Bedroom 1: Master bedroom with a king-size bed, AC, ceiling fan, direct access to the patio, walk-in closet and en-suite bathroom with shower, vanity and WC. 2 guests maximum. Bedroom 2: Bedroom with a king-size bed, AC, ceiling fan, direct access to the patio, walk-in closet and en-suite bathroom with shower, vanity and WC. 2 guests maximum. Bedroom 3: Bedroom with two double beds, AC, ceiling fan, direct access to the patio, walk-in closet and en-suite bathroom with shower, vanity and WC. 2 guests maximum. Bedroom 4: Bedroom with two double beds, AC, ceiling fan, direct access to the patio, walk-in closet and en-suite bathroom with shower, vanity and WC. 2 guests maximum.